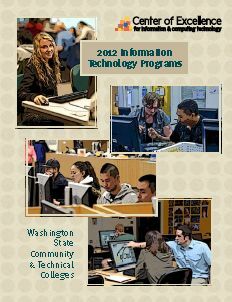 The Washington State Directory of Community and Technical College (CTC) Information and Technology Program (ICT) Program & Resource Guide a searchable database of all IT programs in the CTC system. The IT and CS degree and certificate guide is housed in the YourFuturein.IT site. The Center of Excellence’s funded the development piece of the searchable database which can also be found on YourFuturein.IT website. So, you don’t have to thumb through a document to find a degree or certificate from both 2- and 4-year colleges. By typing in, for example, “web design” you can pull up all the degrees and certificates offered with that two-word search. This also enables colleges to notify the Center (who will be reviewing links every quarter to make sure they are up-to-date) out of cycle if the link is either broken or has changed. Additionally, there is an interactive map; and specific program and college and university information for each degree or certificate. Users can also search by the following IT academic/career pathways and go directly to a comprehensive list of all colleges and universities within the IT pathway. Please contact the Center with any feedback on this new searchable IT or CS degree and certificate database. The prior year’s guides (formerly called directories, see below) devote one-page to each of the state’s community and technical college ICT programs, if offered at the college, and details the title(s) of the program, a program overview, the technical knowledge and skills students will have gained by the time they graduate, degree and certificate options and who to contact for further information. These prior editions can still be used as an excellent resource for career counselors, academic advisors, students, parents and industry to review, compare and consider career pathways leading towards a career as an information and computing technology professional. Please note: These editions are not as current as the online searchable directory; however, they do provide an overview of the IT industry and career pathways. All the colleges will have an opportunity to submit updates to their program details on an annual basis. The next call for updates will be in September of 2012. In this year’s edition (PDF format), there is a new section that identifies degrees and certificates by city and county (using maps and associated legends). All the colleges will have an opportunity to submit updates to their program details on an annual basis. The next call for updates will be December 2011. 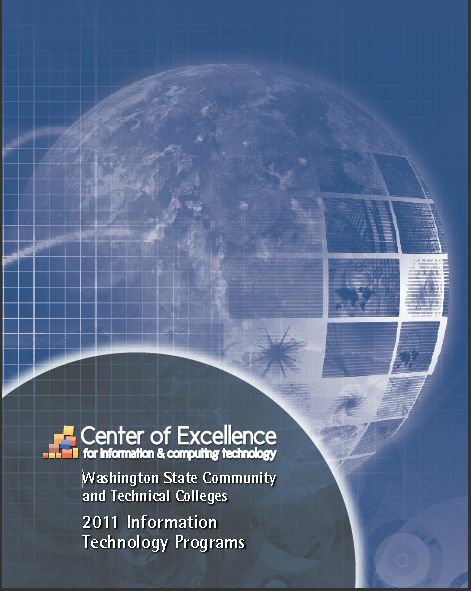 The Washington State Directory of Community and Technical College (CTC) Information and Technology Program (2010 Edition) is still available in a PDF format.